Sailors know that when the wind blows against the tide the sea becomes choppy or even violent. They may sometimes be perplexed by the degree of violence because the water is usually flowing quite slowly in comparison to the wind speed. For instance, where a fresh wind meets a 3-knot current, the sea state becomes a good deal rougher. 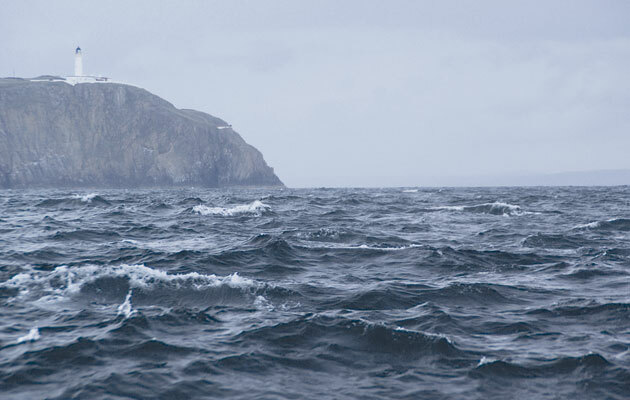 The waves are higher, closely spaced and breaking – altogether much more angry. Small boats that are running downwind threaten to broach wildly as the malevolent-looking crests roll under their sterns. As the 3-knot current is flowing against the wind, this obviously has the effect of increasing the apparent wind speed, in relation to the water surface, by 3 knots. Even so, this is only about half of one Beaufort wind force and hardly seems to justify all the liquid chaos. These ‘overfalls’ are found in many places around tidal coasts. Some are marked on the charts with wavy lines but patches of very rough water may occur wherever there are local variations in the strength of the currents. Being able to understand what is going on beneath your hull is the key to a safe onward passage and a comfortable crew. The rough water we associate with wind against tide is actually produced by the action of waves against tide, sometimes in the absence of any wind. When a train of waves meets a contrary current, the wave pattern is foreshortened. Reducing the wavelength means that the waves move more slowly through the water. As the wave energy moves at only half the wave crest speed, a contrary current will stop waves that are moving four times as fast. When a wave train is stopped, its waves become very steep and are likely to break, but then they fade away and much of their energy is reflected back downstream. The stopping line often appears tobe an abrupt wall of water, formed by a row of steep wave faces. Longer waves, which are too fast to be stopped, become steeper in the strongest current but flatten out again as they progress further upstream. Well downstream, in the tail of the overfall, waves that are rolling upstream against the current meet those reflected from the stopping line and are also distorted by turbulence. This creates an irregular sea. The pointed crests are termed ‘clapotic’ and are typical of a sea state in which some waves have reversed their direction. Nearer to the stopping line, the waves look more regular but are steep and their crests will often be curling and breaking against the direction of the current. Further upstream, just beyond the stopping line, where the current is strong but short waves have been eliminated, the longer waves will be steep but relatively smooth. Turbulence makes the sea rougher or smoother, depending on what waves are present. On a flat sea, the stirring action will generate some waves, but they are usually small. If wind-driven waves arrive that have a short wavelength, they may be destroyed by the turbulence. This is because turbulence forms upwellings, where surges of current rise to the surface. These often appear as spreading discs of very smooth water. 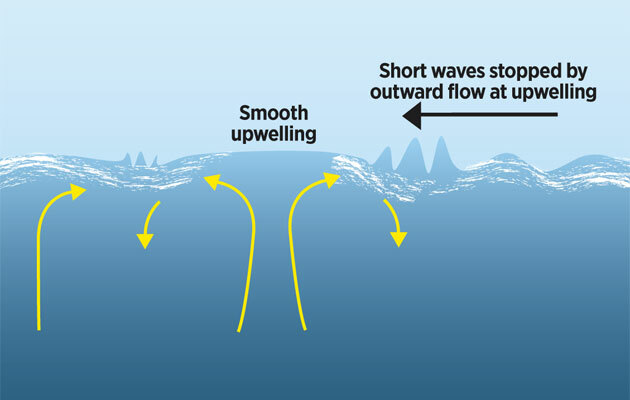 The outward flow at the surface of an upwelling is quite rapid – 3 knots or more in many places. If waves that are moving at less than 12 knots meet such a 3-knot outward flow, they are stopped dead, unable to continue across the top of the upwelling, and the surface of the turbulence looks glassy. Longer waves may be fast enough to progress across the upwellings but they will be traversing a surface where small volumes of water are moving in constantly changing different directions. The wave pattern will be severely disrupted and is likely to degenerate into short, steep crests. A strong current flowing over a shoal usually becomes turbulent on the downstream side, which is also where we’d expect to find wave-against-tide overfalls. The turbulence contributes to the chaotic nature of the sea state in the overfalls. Sailors are sometimes surprised to encounter a tidal race that is relatively docile and doesn’t seem to justify the grim warnings in pilot books. Yet a reversal of tide, at the same place, will produce a vile sea, even when the wind is faint. The problem is usually caused by ocean swell. On days when the swell is slight it may be hardly noticeable on still water, but will become higher and steeper if it meets a strong, contrary current. 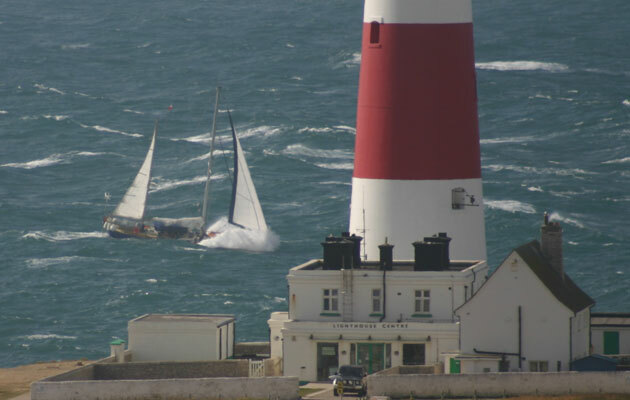 Therefore, we can anticipate rougher conditions when the tidal stream is flowing towards the nearest ocean, for instance off British South Coast promontories such as Portland Bill. Overfalls are most hazardous when their waves are high enough to capsize a small boat or to break heavily over its deck and cockpit. For waves to become high before they break they must also be fairly long and this occurs during storms, when big waves are both high and long. However, long waves also arrive in ocean swell. Even in fine weather, unwary skippers who stray into zones of strong current find life becomes unpleasant when those long, gentle-looking swells suddenly rear up, their crests threatening to topple on board. Short waves will be too low to knock down a seaworthy boat but may become steep enough to cause trouble. When a boat is riding downstream on a current and passes through the stopping line of an abrupt overfall, as in the two photos taken at South Stack, Anglesey, the first waves in the overfall are very short and steep. If they were a little bit higher than in these photographs, their crests could sweep straight over the foredeck, possibly washing all the way aft and ending up in the cockpit. The best way to avoid a soaking is by reducing speed, giving the bow more chance to lift with the waves rather than smashing straight through them. However, the impacts of the hull meeting the waves may well bring the boat to a complete stop and it is necessary to use enough power, either from motor or sails, to maintain steerageway, so the helmsman can hold a course and avoid being caught by a breaking sea on the beam. Once past the stopping line, conditions generally become slightly less threatening. 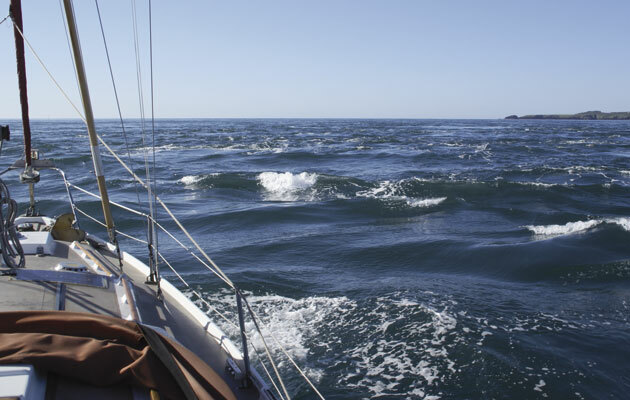 In clapotic waves, it is advisable to keep boat speed fairly low, so the crests can rise and fall without coming on board. However, where a strong current runs across a number of separate ridges and gullies in the seabed, each irregularity will create local variations in the strength of the current and induce its own patch of overfalls. These patches then overlap to form an extensive area of disturbed sea. There is another reason to slow down. If motoring through steep overfalls, there is a good chance of flying the propeller, with a risk of damage to the machinery, as the hull leaps off the crests and bellyflops into deep troughs. Excessive hurry may also give the crew an unnecessary drenching. 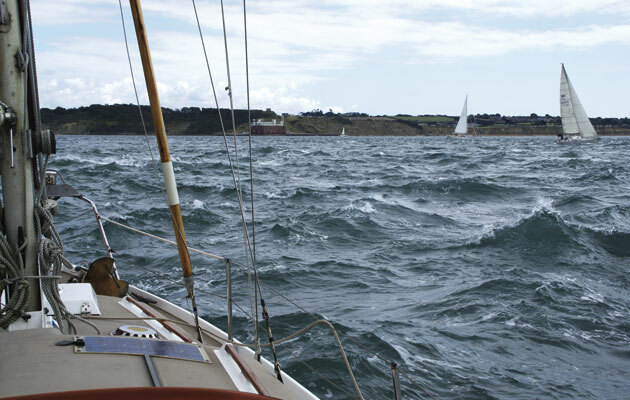 On one occasion, while taking advantage of a strong tide off northern France, my wife and I experienced wild conditions in the Barfleur Race, where the stream was running hard against wind and swell. We reduced our sail area to control speed and keep the sea out of our cockpit. 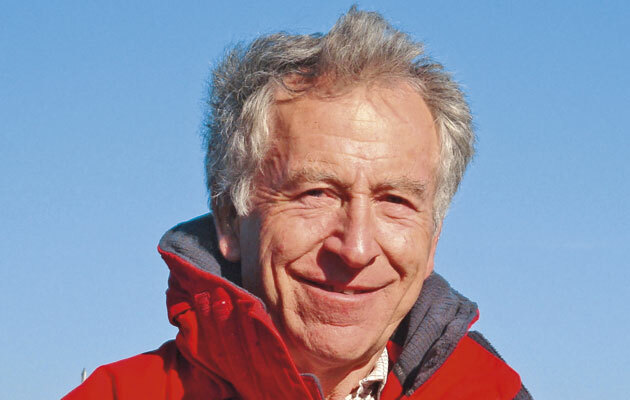 Another boat then came up astern, motorsailing hard in sheets of spray, but on arrival in Cherbourg, her skipper seemed seriously disorientated and possibly suffering from exposure. We are meant to enjoy cruising, so take it easy! Heavy overfalls create other problems for sailing craft. 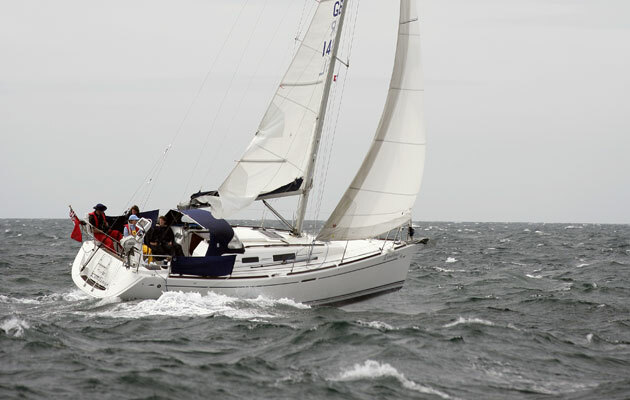 The quick wave motion prevents sails setting properly. 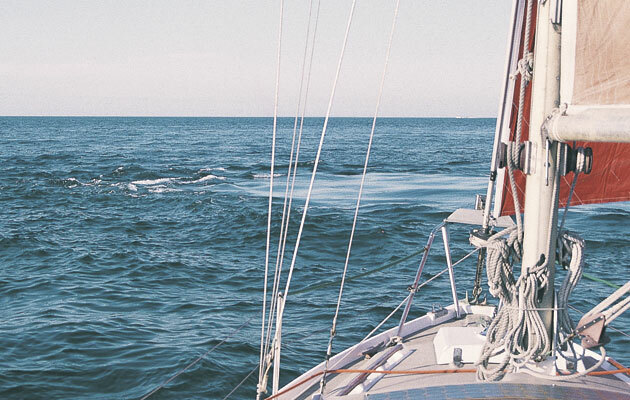 When beating to windward, it may be necessary to ease the sheets and bear away in order to maintain boat speed, using that speed to steer around or through the steepest crests. Tacking is likely to be tricky. 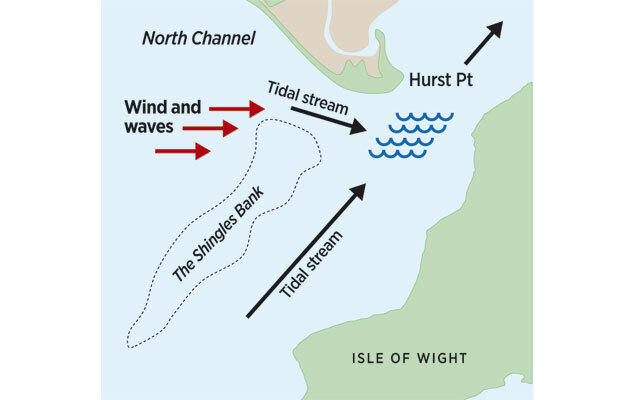 If the overfalls are in a confined channel and the wind is blowing obliquely across the current, it is sometimes helpful to cross to the windward side before entering the overfalls and then stay on one tack, roughly parallel with the stream, until through and clear of the rough water. The powerful 12m boat in the photo has the wind abeam, yet most of its driving force is being lost in pushing her hull over, under and through the steep waves. The Swinge is a notorious tidal race; on the day of the photo it was in a gentle mood because the current was only flowing against a slight swell. 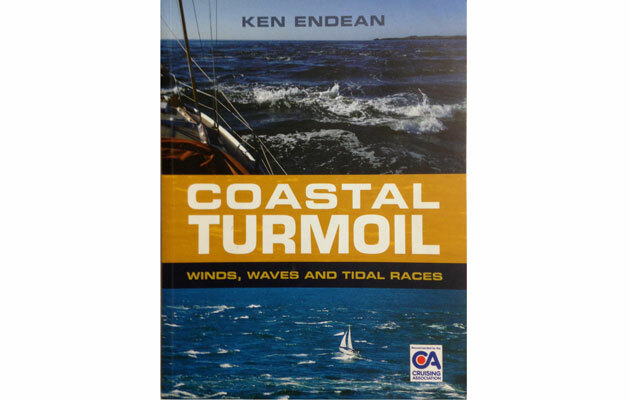 When a boat is running through an overfall against the current, with waves rolling up astern, there are two main risks. 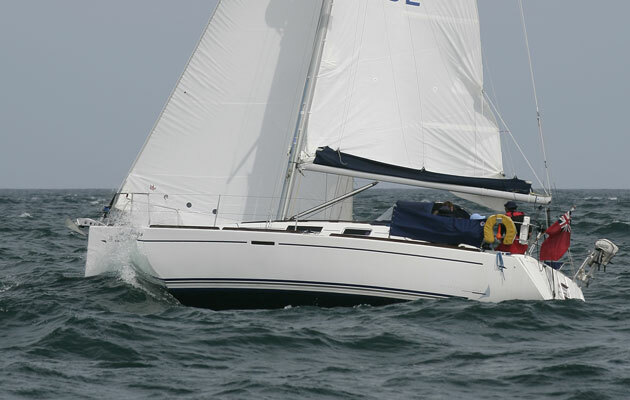 A wave that is very steep could combine with the boat’s stern wave and break against the stern, possibly spilling over the deck or into the cockpit. Also the boat will be inclined to broach because of the relative horizontal movements of water at crest and trough. 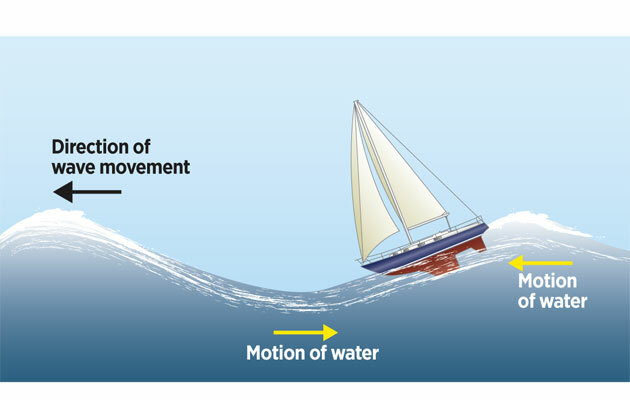 The forward scend, or push, of the water in each wave crest reduces the effect of the rudder, just as the boat is nosedown on the wave face. 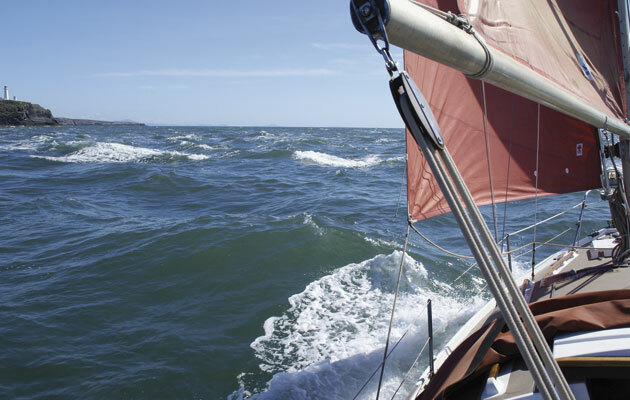 Increasing speed reduces the risk of broaching but might also increase the chance of waves breaking close astern, or alongside. The waves near to the stopping line are short and high but also slow-moving, so their crests linger while overtaking the boat. If the conditions appear dangerous, it may be sensible to reverse course and exit the overfall quickly, going downstream with the aid of the current, rather than persist with slow progress upstream, towards the stopping line. A boat that continues upstream, through an overfall, will likely clear the breaking crests when it passes the stopping line. This is when the crew start to relax, but the current is at its strongest and waves may still be steep. Any course change should be executed very carefully. The photo of Peveril Point, Dorset, shows an area of overfalls in a stiff wind blowing from right to left. 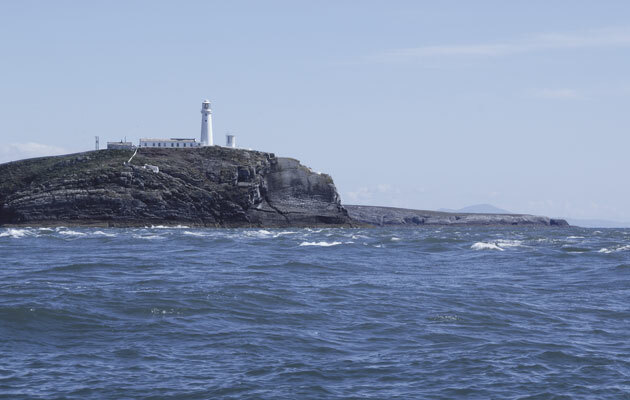 The tidal stream is flowing from left to right, across an undersea ridge that extends from the rocks towards the small, red can buoy. All the larger breaking crests are where we would expect to see them – in the strongest current and downstream of the ridge. However, the picture also illustrates a helpful side effect of the overfalls: most of the surface is choppy with a sprinkling of smaller white horses – except for the area immediately upstream of the ridge, where the surface is free of breaking crests. On the open sea, wave breaking is generally initiated by a combination of short and long waves. Eliminating short waves should make for a noticeable improvement in sea state. The overfall here demonstrates that principle. The shorter waves are halted and the remaining waves subdued after they have progressed over the ridge. The overfall is therefore acting as a breakwater, producing a zone of relative calm. It is sometimes possible to take advantage of this by following a track upstream of overfalls. Obviously, you need to be very careful that you’re not pulled into the rough stuff – or onto a submerged shoal. Even so, this is a useful tactic when carried out competently. 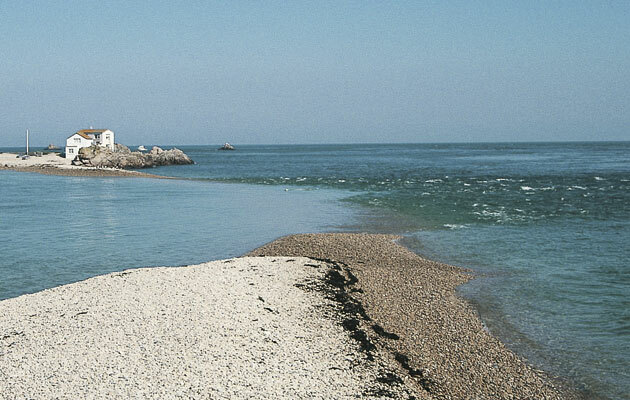 The wave-stopping effect can also act as a breakwater if a tide is flowing out of a river. If the current stops incoming waves, the water within the estuary becomes calmer. The effect disappears at the end of the ebb, but the respite is welcome if a yacht anchors within the mouth of an estuary, to await the flood. Where a current meets another current that is flowing in a different direction, waves will often be distorted or stopped. This might occur where two channels converge, or where a counter-eddy runs contrary to a main tidal stream. If waves are riding downwind on one of those currents, they will suddenly become steeper when they meet the other current. 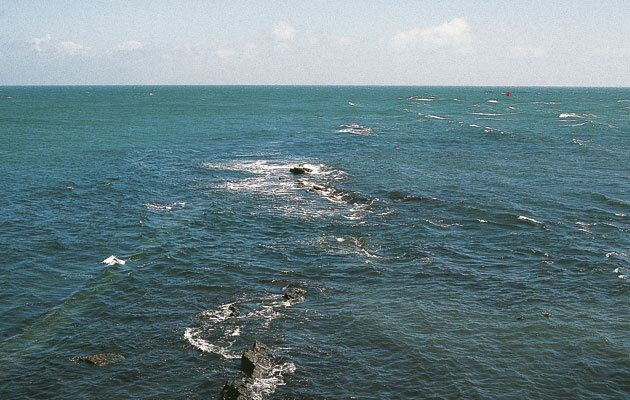 The surface turmoil may be wilder if wave energy is trapped between two converging flows and this frequently occurs off Hurst Castle, at the mouth of the Western Solent. 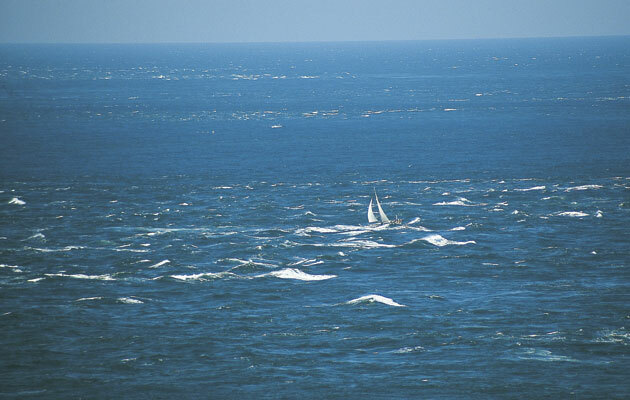 There is usually a patch of choppy water, even when the wind and the tide are moving in the same general direction. 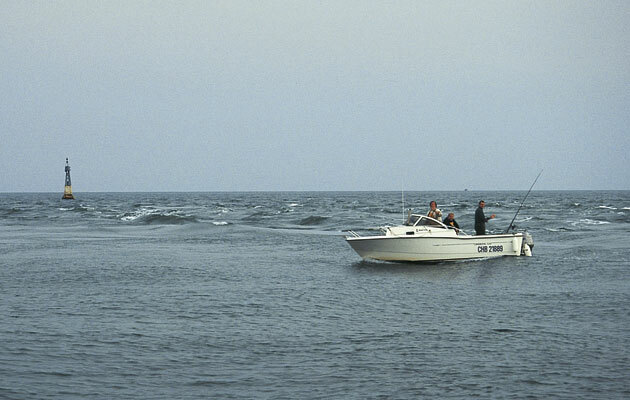 Fortunately for small boats, the waves between converging currents often rise and fall as clapotic crests and are slightly less troublesome than curling breakers. It is as if the sea is raising its hackles, rather than baring its teeth. Even so, the up-and-down motion of the crests is inclined to fling gouts of water and foam into the air, and I have known a big crest dump itself into our boat’s cockpit, when some of the sea found its way below and into my berth. It is better to steer around the problem. If you do find yourself in the middle of this kind of waves-with-tide overfall, make sure that all hatches are shut. Here, most of the time, the risk may be a soaking, but remember, waves and currents are like two high-spirited children. Individually, their behaviour may be tolerable but when they play together they often get up to serious mischief!